WASHINGTON, DC -- Thank you Chairman Corker, Ranking Member Cardin, members of this committee for the opportunity to join you today and for the personal investment so many of you have made in Ukraine’s democratic, European future. 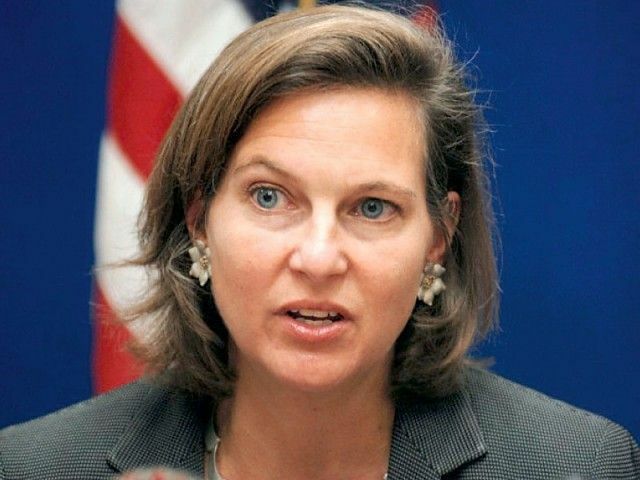 Victoria Nuland Assistant Secretary, Bureau of European And Eurasian Affairs. Your bipartisan support, your visits to Ukraine, the assistance you and your fellow members have provided are truly making a difference. This week we celebrate 25 years since Germany’s reunification – the first major step on our journey toward a Europe whole, free, and at peace. Today that journey goes through Ukraine. Across Ukraine, citizens are standing up and sacrificing for the universal values that bind us as a transatlantic community: for sovereignty, territorial integrity, human rights, dignity, clean and accountable government, and justice for all. America helps Ukraine because that country’s success is central to our own profound national interest in an ever more democratic, prosperous, stable Europe. Ukraine’s aspirations are ours. • The September 1st ceasefire in eastern Ukraine is largely holding, the Minsk parties have signed and begun to implement agreements to pull back their heavy weapons, and some IDPs are returning home. While we welcome this progress, Ukraine still has a long, hard road to travel. In my remarks today, I will first discuss implementation of the Minsk package of agreements; I will also give an update on the work that Ukraine is doing, with U.S. and international support to reform the country, tackle corruption, and to strengthen democratic institutions; and, finally, I will focus on the tough work ahead to cement Ukraine into Europe and the community of successful democracies. The September 2014 and February 2015 package of Minsk agreements remains the best hope for peace, weapons withdrawal, political normalization, decentralization in Eastern Ukraine, and the return of Ukrainian state sovereignty over that part of its border. Yet in the eight months since the February signing of the implementing agreement, Eastern Ukraine has seen almost constant violence all along the contact line, continued weapons shipments from Russia masquerading as humanitarian aid, separatist filibustering and threats at the political negotiating table, and repeated Russian efforts to relitigate basic elements of Minsk. On September 1st, however, the guns largely fell silent. And on October 2nd , in Paris, President Putin agreed to put a stop to the separatists’ threat to hold another round of fake elections. Instead, he committed to Presidents Poroshenko and Hollande and Chancellor Merkel to withdraw heavy weapons, allow full access to the OSCE all the way to the border, and to negotiate modalities for real elections in Donbass under Ukrainian law, safe conditions, and observation by OSCE’s ODIHR. If these commitments are kept– if weapons are pulled back and stored, if the OSCE gets in, and legal, monitored elections are negotiated and held– Ukraine will once again have unfettered access to its own people and its territory in the East. That’s what Minsk promises: peace, weapons withdrawal, political normalization, then a return of the border. As President Obama did with President Putin in New York, we will also keep pushing to complete other unfinished aspects of Minsk– the return of all hostages, including Nadia Savchenko, Oleg Sentsov, and those held in Russia; full humanitarian access for UN agencies, Ukrainian NGOs, and government relief agencies; and the removal of all foreign forces, weapons, and landmines. We understand why – after almost 2 years of violence, war and lies – many Ukrainian patriots and some in the West doubt Russia and its proxies will ever allow full implementation of Minsk. But Minsk implementation remains a goal worth fighting for because the alternatives are bleak: at best, a frozen conflict in which Donbas becomes an unrecognized gray zone for the foreseeable future; at worst, a return to the war that has already claimed too many Ukrainian lives– and Russian lives, as well. So we will keep supporting Ukraine as it does its part to implement Minsk. Along with the Normandy powers, France and Germany, we will keep pushing Russia and its proxies to demonstrate equal good faith. As the President and Secretary Kerry have repeatedly said, we will judge Russia and the separatists by their actions, not their words. We will work with the EU to keep sanctions in place until the Minsk agreements are fully implemented. And of course, Crimea sanctions remain in place so long as the Kremlin imposes its will on that piece of Ukrainian land. While 7% of Ukrainian territory remains under threat, the other 93% is fighting a different battle: to build a democracy that is closer to its people; an economy where what you know matters more than whom you know; and a society where law rules rather than corruption and greed. The electoral, judicial, financial, and anti-corruption reforms already put forward by the government and enacted by the Rada are impressive in their scope and political courage. • The latest IMF forecasts released this week predict Ukraine’s economy will grow by 2% in 2016. • And, Ukraine’s foreign reserves have increased to $12.8 billion, up from a low of $5.6 billion in February. With Congress’ unwavering support, the United States has committed to provide over $548 million in assistance to Ukraine since the start of this crisis, in addition to two $1 billion loan guarantees. With continued progress on economic reforms and as conditions warrant, we will ask you to work with us on a third loan guarantee of up to $1 billion. U.S. economic and technical advisors advise almost a dozen Ukrainian ministries and localities. Our $69 million in humanitarian support helps 2.4 million displaced Ukrainians through international relief organizations and local NGOs. Because there can be no reform in Ukraine without security, $266 million of our support has been in the security sector. This includes sending: 130 HMMWVs, 150 thermal and night vision devices, over 300 secure radios, 5 Explosive Ordnance Disposal robots, and 20 counter-mortar radars. Just last week, we notified Ukraine that two more life-saving long-range counterfire radar batteries are on the way. And, in November, we will complete a $19 million train and equip program for Ukraine’s National Guard and begin training Ukrainian Ministry of Defense forces using $45 million in European Reassurance Initiative funding. Ukraine has already put this equipment and training to good use. When combined Russian-separatist forces tried all summer to break Ukrainian lines at Maryinka and Starohnativka, they were pushed back again and again by Ukraine’s increasingly professional military, and Ukrainian lives were saved. Because the best antidote to Russian aggression and malign influence is for Ukraine to succeed as a democratic, prosperous, European state, the Ukrainian government must continue to live up to its promises to its own people and maintain the trust of the international community. As I said, much difficult work remains to clean up endemic corruption throughout government and society, at every level; to stabilize the economy; break the hold of corrupt state enterprises and oligarchs; and reform the justice system. • And, the government must appoint the NABU Anti-Corruption Prosecutor ASAP in order to start investigating these crimes. Ukraine is well situated to provide products and services to Europe and Eurasia, but must improve the business climate by dismantling thousands of duplicative functions and transparently privatizing approximately 1800 state-owned enterprises, and do more to recapitalize and repair its banking system. Clean governance and business practices that root out corruption are essential to attracting more foreign investment and development opportunities. Ukrainians also need a justice system that cannot be bought, one that will deliver verdicts, uphold the rule of law, and stop injustice, which was a key demand of the Maidan protests. Currently, only 5% of the Ukrainian population completely trust the judiciary. Inspiring confidence will require passing the constitutional amendments to limit judges’ immunity, improve judicial ethics and standards, and rigorously investigate judicial misconduct and enforce disciplinary rules and dismissals. While Ukraine works through these tough challenges, the United States, Europe, and the international community must keep faith with Ukraine and help ensure that Russia's aggression and meddling can't crush Ukraine's spirit, its will, or its economy before reforms take hold. We must challenge the false narrative that nothing can or will change in Ukraine. To fight disinformation not only in Ukraine and Russia, but across Russian-speaking communities in Europe, we are joining forces with our partners in the EU to support alternatives to state-sponsored, Russian programming. We are also training foreign journalists and civil society actors in the art of fighting lies with the truth. Mr. Chairman, Mr. Ranking Member, members of this committee, America's investment in Ukraine is about far more than protecting the choice of a single European country. It's about protecting the rules-based system across Europe and around the world. It's about saying no to borders changed by force, to big countries intimidating their neighbors or demanding a sphere of influence. I thank this committee for its bipartisan support and commitment to the sovereignty and territorial integrity of Ukraine and to a Europe whole, free and at peace.